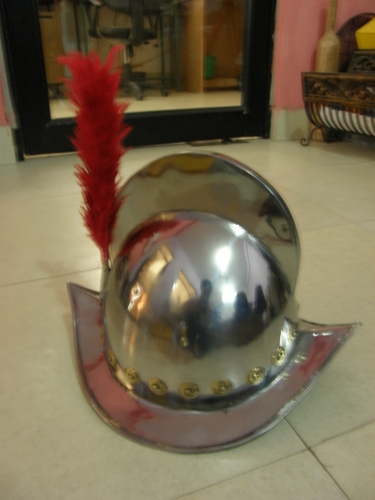 Spanish comb morion brass accent with red plume. It is good quality product. It is best offer for cllectors. Nautical Mart Inc. a brand name for comprehensive range of nautical items, armors, armour helmets and gifts & brass art ware. Nautical Mart Inc is the world's largest & most reputed manufacturers and wholesale company for antique & elegant gadgets, nautical home decoration, nautical gift item, telescopes, compasses, sextants, clocks, magnetic compass, gramophone, telephone, search light, spot signal light, tripod, bases, suit of armor etc. Since our inception, we have been striving to attain expertise in the field of engineering premium quality products. We have made a respectable place for ourselves in the industry due to sheer hard work and dedication towards our valuable clients all across the globe. We export all our products to almost every nook & corner of the world. At Nautical Mart Inc., we design and fabricate beautiful art-wares to suit our clients' aesthetic sense. In our expansion plan we require wholesale and retail customer who can promote our products worldwide and we are also planning to start working with some big brand for developing there props. We supply quality products to our customers and ship our products within 1-10 days of receipt of order as we always have stock of our products. We ship more than 400 shipments per month to our customers. Our buyers are satisfied with our quality and sending regular orders to us for last 16 years as we developed all our infrastructure, quality and other as per customers demand.